Mr. Benediktas Vanagas 'motorsports' career saw him gently drift towards the Dakar. 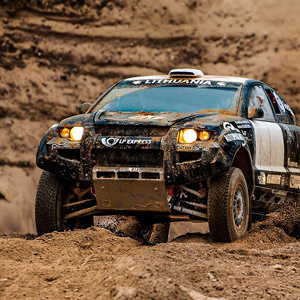 After competing on circuits and then on regular rallies, the Lithuanian turned to off-road rallies. After experiencing events such as the Silk Way Rally and the Abu Dhabi Desert Challenge, he managed the big step up to the Dakar in style. Driving an Oscar O3 that had already proved its competitiveness on the Dakar. For his second experience in Dakar 2014, he will be competing alongside newcomer Andrei Rudniski with the goal to go even higher in the standings to be on top lines! Lubrita Lubricants team wishing the safe and fast driving for all nations drivers in Dakar!